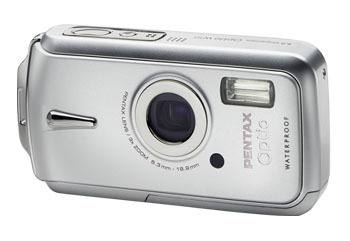 Pentax Optio W10 is a point and shoot waterproof and lifeproof digital camera. Pentax Optio W10 features 6.0 megapixel CCD, 3X Pentax optical zoom lens, up to 0.36 inch macro shots, 115,000 pixel 2.5 inch low reflection LCD monitor, 0.6 second start-up, 0.05 second shutter lag, 9-point Autofocus with Tracking AF, portrait mode combines Face priority AF with Face priority auto-exposure, QuickTime motion JPEG (640 x 480) movie captures at 30fps with anti-shake and a range of built-in editing functions, and last but not least, JIS Class 8 waterproof and JIS Class 5 dustproof ratings which allows direct underwater photography and video without additional accessories. TrustedReviews (dead link) reviews Pentax Optio W10 and concludes with rating of 8 out of 10 that the W10 takes the unique abilities of the WP and WPi and improves on them. Better image quality, better movies, better handling and faster overall performance make it indisputably a better camera, while the lower launch price makes it even better value for money. If you’re into skiing, surfing, snorkeling or any other camera-killing lifestyle, but still want a sleek pocket compact then it really is the best option.